In Bruges there are some world famous dishes that simply must be tried. Belgium is, of course, famous for its chocolate, waffles, fries, and beer, but if you want to eat outside the cultural box and go for something utterly Belgian but totally different, these top 5 restaurants should fit the bill perfectly. There are two floors to this superb restaurant, the second opening due to high demand. No matter where you are seated, however, the ambience is wonderful, and the service impeccable. With wine to match each dish, and recommended by the waiting staff, you can enjoy a truly memorable meal here, eating just the right food, drinking just the right drinks, to really showcase the chef’s skill. This is classic Belgian cuisine and includes dishes such as crispy mushroom and spinach pie, butter baked baby Dover sole, or lamb in a red wine sauce. There is an a la carte menu and also an all inclusive set menu, so whatever your budget, Park Restaurant is excellent value. Opened in 2007 on a tight budget (the decorations were all taken from the owner’s home, or found in flea markets), Pro Deo has risen extremely successfully through the ranks of the many restaurants in Bruges. Described by visitors as cosy, romantic, special, and with a warm welcome, Pro Deo is the place to go whether you have a special occasion to celebrate or you simply want good, well cooked food. Dishes include Belgian beer pate, goats cheese on a bed of grilled mango, stoofvlees (Belgian stew), and Dame Blanche (vanilla ice cream, chocolate sauce, and more cream!). There is a children’s menu so the whole family can enjoy Pro Deo, and the portions sizes are… generous! Owner Nathalie will welcome you (she speaks four languages) and make you feel right at home. If you have a hankering for Greek and Mediterranean food, the Olive Tree is the place to go. The owners love their restaurant, and it shows in everything they do – the food, drink, the atmosphere, and the décor; it’s all about enjoyment and having a wonderful experience. Food includes grilled squid, meatballs, stuffed chicken, and chocolate orange cake – all using sustainably farmed ingredients, local to the restaurant. If you're lucky, the staff will put on a display of Greek dancing for the patrons – join in and you might even get a free drink or dessert! At the name suggests, the Ribs 'n' Beer restaurant specialises in ribs… and beer. And sometimes, that’s all you need for a fantastic, mouth watering, utterly unforgettable night out! The menu is unpretentious, and for a set price you can choose all you can eat ribs, nachos, a dessert, and beer. The ribs come in a variety of different sauces, and they are slow cooked to perfection. 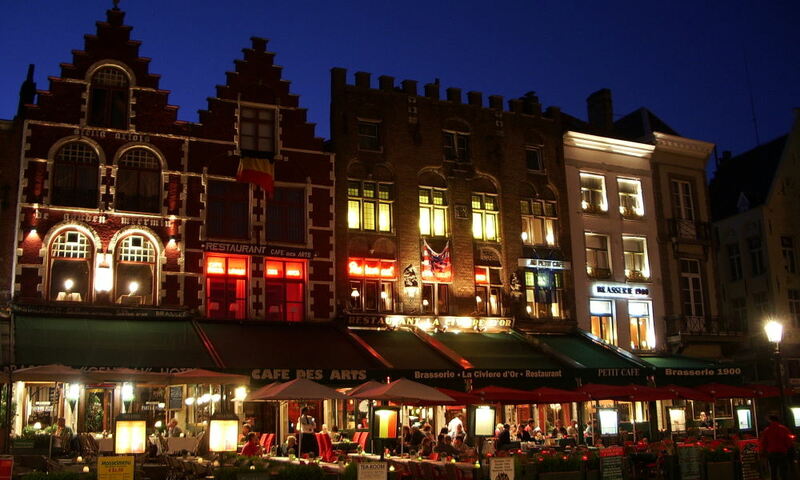 Booking is essential – ribs are extremely popular in Bruges! Traditional South African fare meets modern Belgian cuisine in 't Huiskombuis, a fun, friendly, vibrant restaurant. Choose from the set menu and you will discover taste sensations you never thought possible – baked scallops with bacon crumble, butternut soup with lemongrass, zebra, safari kebab (a selection of different African game), and gebakte pisang (fried banana with Amarula). Different and delicious in equal measures. The restaurant is seasonal, so the menu changes throughout the year to reflect the produce available. Book a mini cruise to Bruges.